Chinese egg rolls, also known as spring rolls (春卷), are a popular snack and appetizer not just in China and Taiwan, but all over the world. Egg rolls/spring rolls come in different sizes and a variety of fillings like meat and seafood but there also are vegetarian versions. For example, Chinese and Taiwanese people like their rolls quite small but if you order an egg roll in a Chinese restaurant in the U.S., they will be much larger. 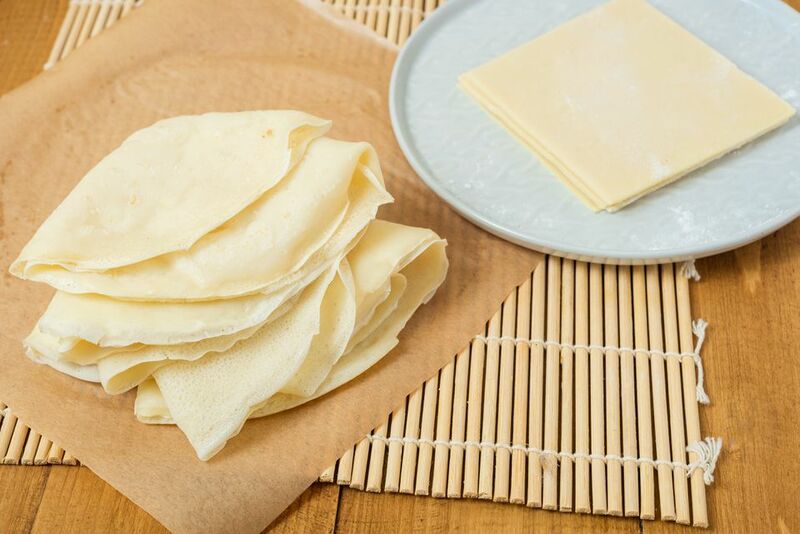 This recipe is for a cooked wrapper that can be used like a French crêpe. See the variation below for uncooked wrappers that are rolled out like pie dough and then filled and cooked. In a large bowl, whisk together flour, salt, water, and egg until the mixture looks like pancake batter and there are no lumps. Heat a 12-inch skillet over low heat. Swirl in a bit of cooking oil or coat with cooking spray. Pour 1/2 a ladle of the mixture into the skillet and quickly rotate it to spread the batter across the entire bottom of the pan as if you were making French crêpes. Let cook until lightly brown on the underside and then loosen the edge of the spring roll wrapper with a spatula, and quickly flip. Cook the second side for 3 to 4 seconds. Remove from the skillet onto a piece of parchment paper or waxed paper and repeat with remaining batter, shingling the pancakes on top of each other as they are done. Store the wrappers in a plastic bag and keep in a refrigerator or freeze. In this version, mix together 2 cups (225 g) all-purpose flour, 1 large egg, 1 teaspoon salt, and 1/4 cup ice water. Add up to 1/4 cup more ice water, if needed, to make a sticky dough. Turn the dough out onto a lightly floured surface and knead until for about 5 minutes or until smooth and elastic. Let the dough rest for 30 minutes, then knead it briefly. Cut the dough ball in half and wrap one dough ball in plastic. Turn the other half out onto a lightly floured surface and roll out thinly. Cut out squares measuring 3 1/2 inches. Re-roll scraps if necessary, and repeat with remaining dough ball. Stack the wrappers by lightly dusting with cornstarch between them to prevent sticking. Use immediately or freeze until ready to use. Egg rolls is one of the dishes served at the Manchu Han Imperial Feast. Traditionally, Taiwanese people serve spring rolls during the New Year and at spring staff parties (Weiya 尾牙) in the companies they work for to celebrate the start of the new year. The wrappers in this recipe also can be used to make popiah (潤餅), a Malaysian spring roll, in which a cooked spring roll wrapper is rolled around cooked fillings and eaten as is without deep frying it.